Yamaha's Vocaloid Keyboard: who fancies making an English-speaking version? We don't think Yamaha is actually showing it at Musikmesse - apparently, there are no plans to release it commercially - but the Vocaloid Keyboard is certainly one of the more interesting products we've come across recently. 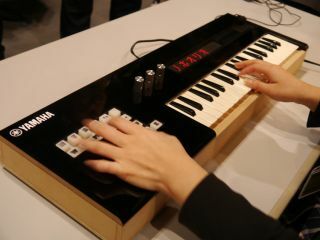 As its name suggests, it takes Yamaha's Vocaloid 'singing synth' software technology and puts it in a piece of hardware. It can be made to 'sing' in real-time by using the 16 Japanese consonant, vowel and voicing mark buttons on the left together with the standard musical keyboard. Although you'll probably never be able to buy this, Yamaha has said that its sound chip can be removed and could be used by other interested companies.